With some children who have heart problems, it may be possible to treat it in the heart catheterization laboratory. A cardiac catheterization with an interventional procedure means that some form of repair will be made through the use of a catheter, rather than just using the catheter to collect information (diagnostic procedure). Examples are closing holes in the heart, blocking off abnormal blood vessels, or as an adjunct to surgery. A catheter is a hollow plastic tube about the size of a piece of thin spaghetti. It shows up on the special x-ray camera that is used in the catheterization lab. 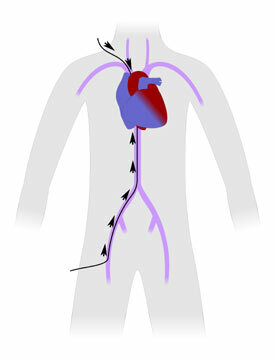 Interventional catheterization uses special catheters to treat some heart problems, for example a narrowed valve can be widened.